Based in Switzerland with clients around the world, MPI offers products, R&D services and consultancy in high power ultrasonics, a range of top quality ultrasonic cleaning and sonochemistry equipment and special equipment development for new applications. Learn more about the company here. We wish to make contact with companies specializing in stem cell research and commercial exploitation for the purpose of developing new and enhanced processes which will improve outcomes for patients. Our objective is to combine the known benefits of ultrasonics and stem cell therapy. Existing equipment for laboratory-scale liquid processing and for therapeutic massage can be readily adapted for use with stem cells, during growth and preparation and after injection into the patient. Laboratory trials will evaluate the effects of ultrasonic agitation during stem cell culture and clinical trials will determine the benefits of ultrasonic stimulation after injection. New Article: MMM Ultrasonic Metallurgy (4MB pdf) from Aluminium International Today, the journal of aluminium production and processing - May/June 2014. www.aluminiumtoday.com. New photos and published papers showing the benefits of casting molten aluminium with ultrasonic degassing. Please see also this video of fluid rotation by ultrasonics - another effect in metal processing in addition to degassing, homogenization, crystallization, grain refining. Here water and coffee particles are used to demonstrate the effect in the lab, but in reality liquid metal also rotates during processing. Our tube reactors, also based on MMM Technology, are ideal for all through-flow sonochemistry applications providing high intensity, uniform sonication under your complete control. Various sizes available. Our revolutionary clamp-on ultrasonic systems drive your existing pipes, reactors or pressure vessels, even glass tubes and vessels - with the versatility of MMM ultrasonics. Ultrasonic systems for the most demanding applications: "MMM Technology" (Multifrequency, Multimode, Modulated Sonic & Ultrasonic Vibrations). Details pages for ultrasonic generators: OF series, OW series, IX series, controllers. MMM ultrasonics manuals on pdf. An unusual application for ultrasonics - atomization of molten metal alloy. The sonotrode uses a special tip (which is different for atomizing different metals) and water cooling. More information. Foil immersed for only a few seconds in a benchtop ultrasonic reactor powered by MMM technology. The extent and uniformity of the perforation cannot be matched by any conventional ultrasonic system. The details page includes a small animation and the complete video clip is available for download on our download site. For high-energy ultrasonic cleaning and sonoreactors, if MMM technology is not required, we also offer this range of top-quality "Push-Pull" transducers (tube resonators), driven by modular generators to suit all power requirements. This is a short video of our prototype ultrasonic compaction unit for reducing the volume of powders in the pharmaceutic industry. (File size 1.5Mb. You may need to download the file first - Right click, "Save target as" and / or download Apple Quicktime). Another application of MMM Technology - prototype equipment for proving a process of ultrasonic cleaning in supercritical liquid CO2 (more). Prototype equipment for ultrasonically assisted extrusion of composite plastics. MMM Technology allows the application of ultrasonics directly at the extruder head (more). For more information about our products, or recommendations for applying ultrasonics to your process, please contact Miodrag Prokic and/or see NEW APPLICATIONS and ***MORE***. Mastersonic.com -- wideband sonic and ultrasonic technology for cleaning, welding, liquid processing and sonochemistry. Extensive library of ultrasonic technical documents on pdf. UltrasonicsWorld.com -- top-quality replacement ultrasonic and sonochemistry components at super-low prices. Fully compatible with standard components from major manufacturers. 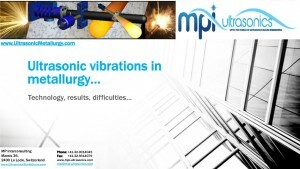 Active Ultrasonic -- MPI provides continuing support for all projects of the former company Active Ultrasonic. SonicDiagnostic -- SonicDiagnostic supplies innovative products and solutions for acoustic measurement and component / material testing based on Acoustic Resonant Inspection (ARI).